Sample AD €150 - Marry Me In Donegal your wedding site! PLUS you get the smaller advert (the €75 advert) on our site for FREE. This advert then links to your full page advert which means you get two adverts for the price of one. AND up to 30 of your photographs below (plus the lead photograph ~ above ~ making a total of 31 photographs). All photos can be clicked on to enlarge for the reader to better see them AND the photos will all be tagged with your business name and your business name will appear under each photograph. 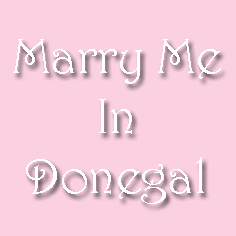 (There is a Contact Form at the end of this page where you can contact us to get your advert on Marry Me In Donegal).